Happy New Year! We're looking forward to bringing a bunch of new music to you this year in the form of the long awaited Third Act album which will round out the 'Act' trilogy in style. Stay tuned for updates over the coming weeks and months! Want to see more vids by Against Them? 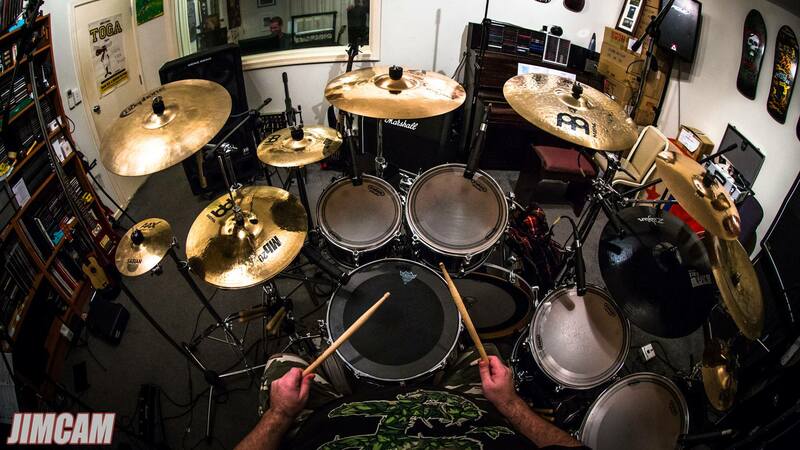 Click here and subscribe to our youtube channel! We're stoked to bring you our new film clip 'The Man From Outer Space'. It's the second single from the Vita Nova EP ... Check it out in the Latest Vids to the right or click below, enjoy! We were recently featured in an interview by the awesome guys at Spire Focus. A few points were raised that we've never discussed before and we're sure you'll find it an entertaining read. Click here to check it out! 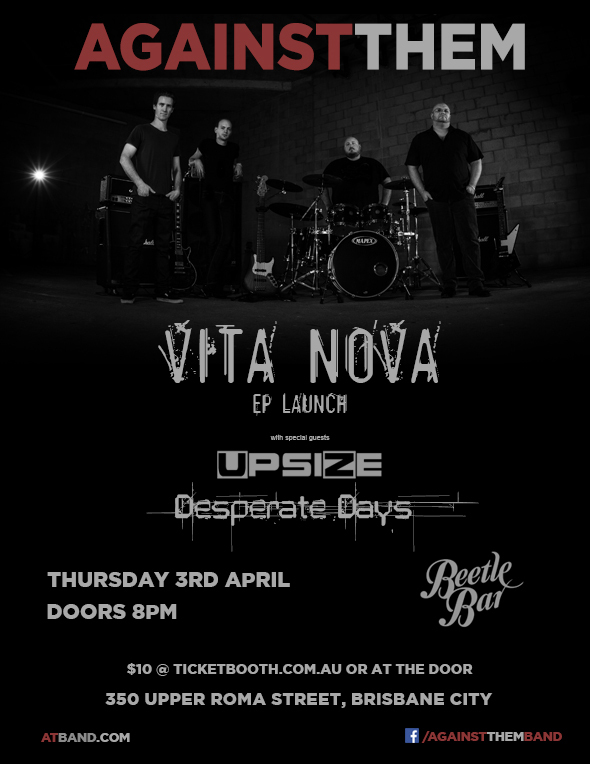 VITA NOVA EP LAUNCH - UPDATED! Thanks to all who came down to our launch on Thursday, a great time had by all. Check out some pics here!. Come and celebrate the release of our newest EP - Vita Nova! We're playing on Thurs 3rd April at the Beetle Bar, 350 Upper Roma St, Brisbane City. 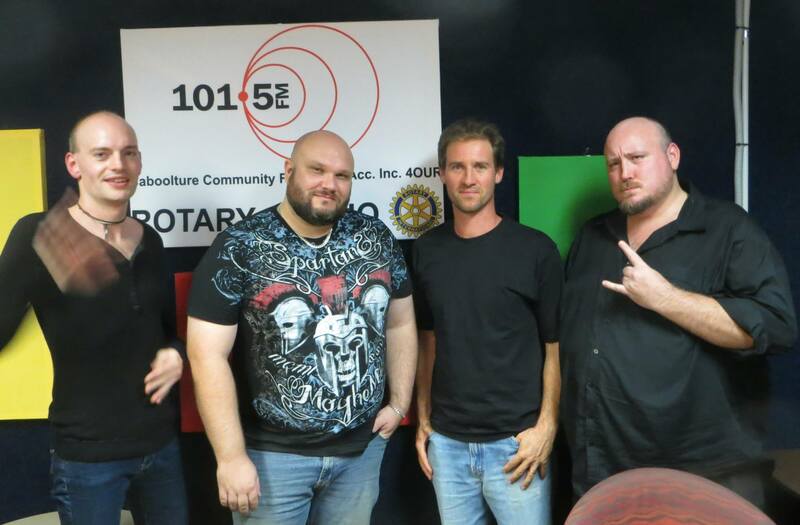 Joining us on this special occasion are local rock legends Upsize. We'll also be enjoying the sounds of Desperate Days, one of the newer bands on the scene. For tickets click here. Welcome to the new Against Them website! There's plenty of things to check out so get in and explore. We'll feature different areas of the site in the coming weeks. We'd love to know what you think so feel free to drop us a line here. UPDATE: Hi all we have been advised that "Due to circumstances beyond the control of Rockden Promotions, the festival that was to be held at Happy Valley Estate, Toogoolawah on Saturday February 8 2014 has been cancelled. Tickets that were purchased will be refunded in full." If you have queries please contact us. thanks AT! So, after many years and countless queries on the meaning of our band name the time has finally come to take things to the next level and expand on A.T. We proudly announce our name 'expansion' as .... 'Against Them'. LAST MINUTE GIG - IN FACT, LAST ONE FOR THE YEAR! Some friends of ours had to pull out of a gig and asked us to step up, 'Of course!' we said! so we're playing at the Chardons Corner Hotel on Friday night ... rockin' out with Lunar Seasons and The Shakeouts. Come on down for a great night...details below: Chardons Corner Hotel Cnr of Cracknell & Ipswich Rds, Annerley, Brisbane 8:30 pm The Shakeouts AT Band Lunar Seasons. Free Entry.